PORTLAND, CT – If you ride by a place often enough, it’s only natural to get curious about it. Is it any good? 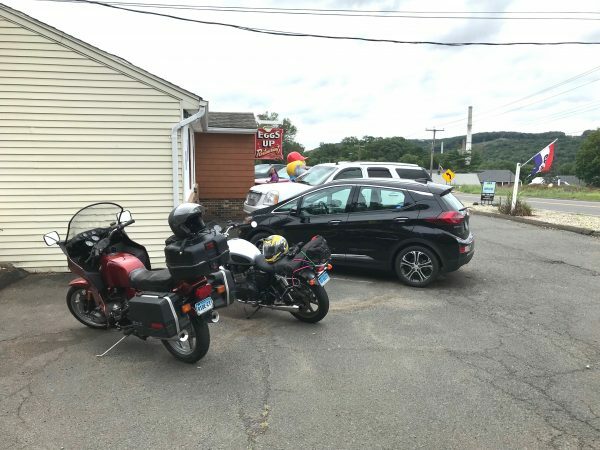 Eggs Up Restaurant on Route 66 in Portland, CT (but nearer to Cobalt) was such a place until last weekend. Up until Sunday, the time to stop had never been right, but a grumbling stomach and a half-hour to spare on the way to Brit Jam provided a sufficient window to pull in and test the breakfast menu. Let it be said at the outset that Eggs Up has a sense of humor, beginning with the smiling elephant statue that points the way to the entrance. Once inside we quickly found a seat and were promptly offered coffee. Riding pal (and “Always Riding” columnist) Paul Siciliano also ordered orange juice. 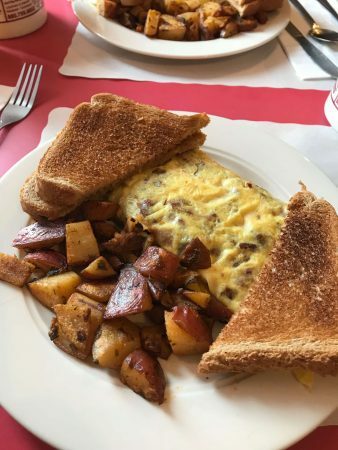 We then scanned what is a lengthy breakfast menu with numerous omelets and other egg options, pancakes, French toast, and specials. 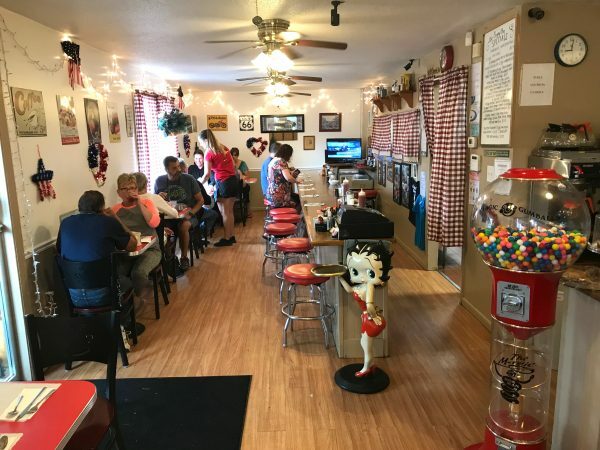 The lunch menu has sandwiches, burgers, hot dogs, wraps and salads. There are also numerous gluten free offerings. While the seats at the front counter were largely unoccupied, most of the tables inside Eggs Up were filled. 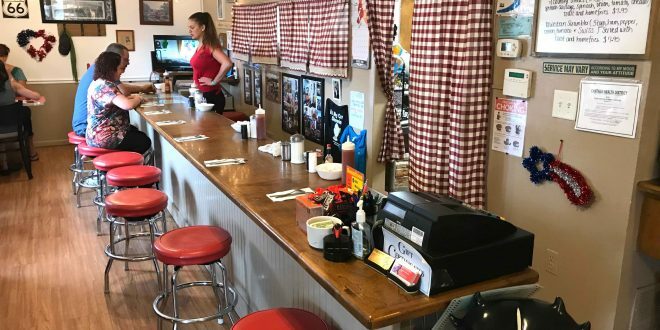 What struck me immediately about the country decor was how neat and balanced it looked, a nice mix of eccentric and rustic. Paul and I opted for omelets. Paul had the Italian, with Italian sausage, roasted peppers, sun-dried tomato and “lots of cheese,” while I ordered bacon and cheddar. They arrived in a short time, accompanied by home fried potatoes and wheat toast. And, yes, the omelets were sizable and well-prepared. As we ate, Paul noticed the back of a T-shirt worn by one of the servers and told me to check it out. 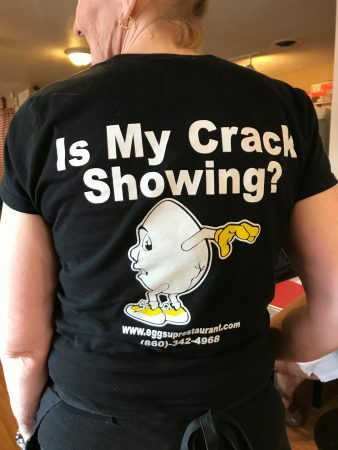 Did I mention Eggs Up has a sense of humor? The service was excellent, the food tasty and establishment was clean. What more does anyone need to know? By now, motorcycles were rolling by on the way to Brit Jam. We went back outside and joined the procession having had our curiosity and our hunger pains satisfied. 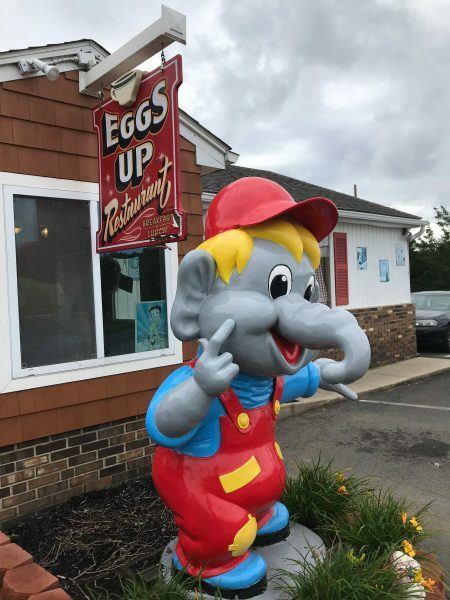 Eggs Up is open from 5 a.m. until 1 p.m. seven days a week.